Results in miles and yards. Plus 1 to 50 kilometres to miles and yards chart. Convert kilometres and metres into miles and yards. Conversion table included for the first 50 kilometres. 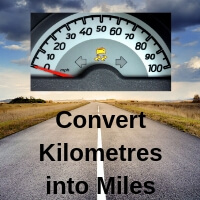 Further km to mile conversions from 100 to 2000 kilometres. Convert kilometres + metres into miles + yards. Enter a value in to the Kilometres and metre text box and click associated Get Results. Miles and yards value is below. Decimal places are accepted with the input.